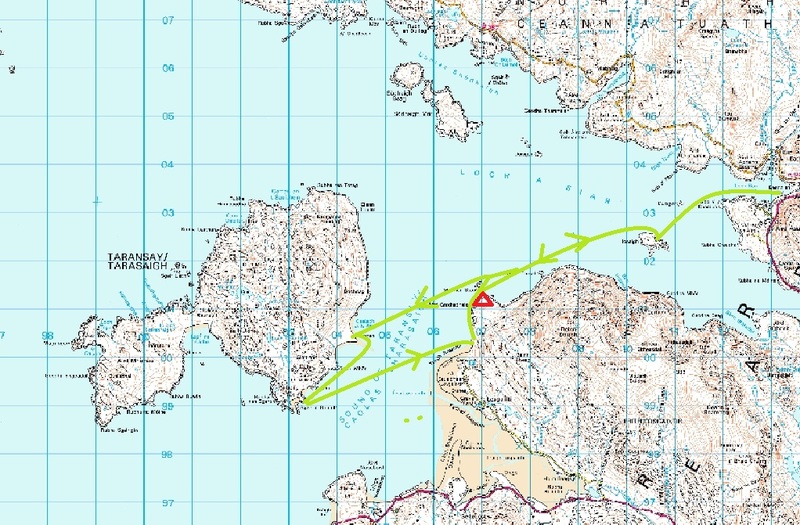 We left Ard Asaig, a couple of miles west of Tarbet, at about 11.30 having caught the morning boat from Uig and over-nighted in a camp site by the ferry port at Uig. 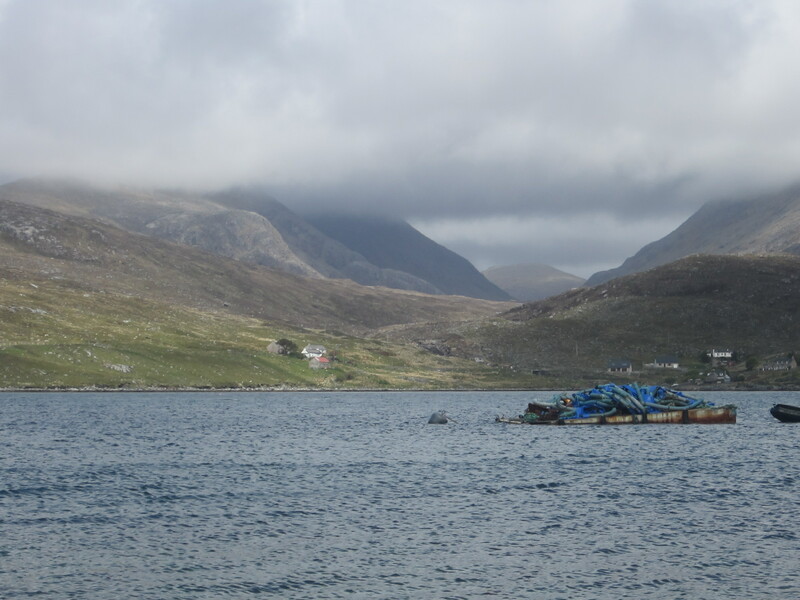 The weather was as forecast, cold and windy with the cloud almost down to the loch. 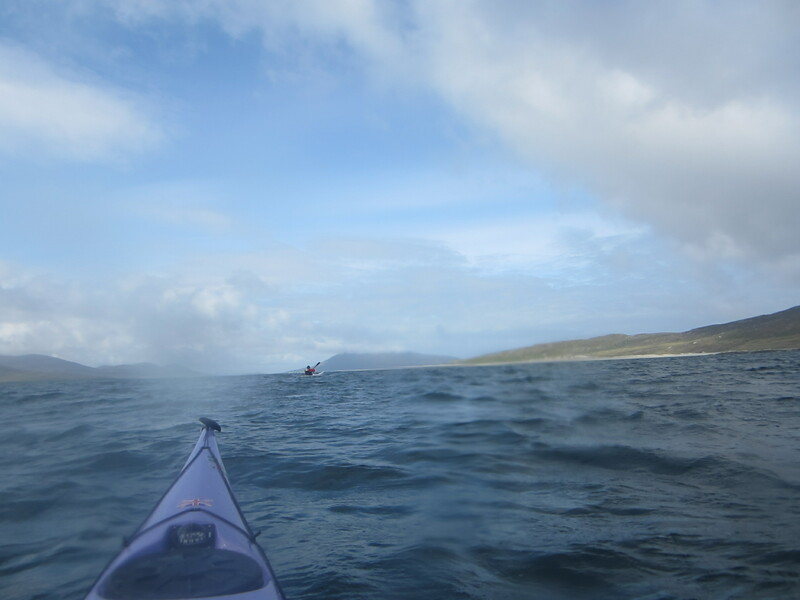 The initial paddle to the lunch break on Isay was quite tough but after lunch we hit the main swell and force 5 winds. 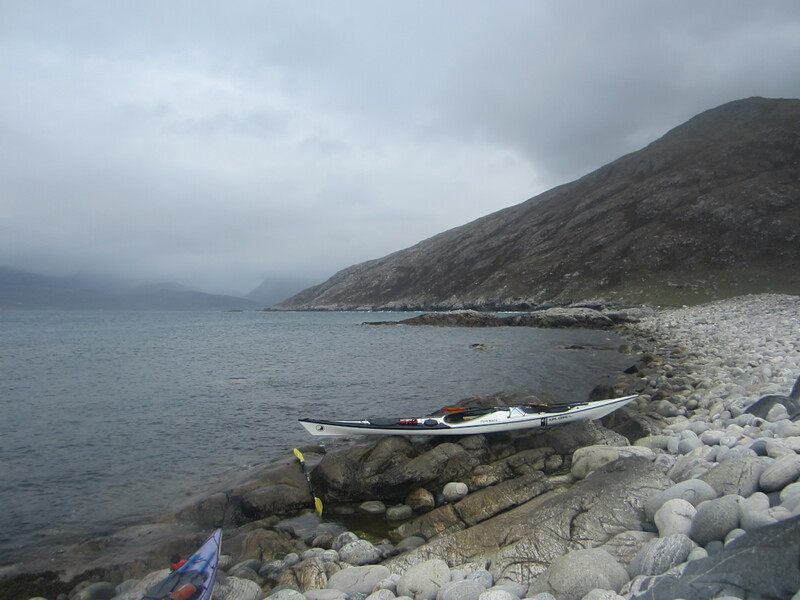 Just as we were contemplating retreat we spotted a rock beach and landed, hoping for the weather to ease. It did not and a tent was pitched for shelter. 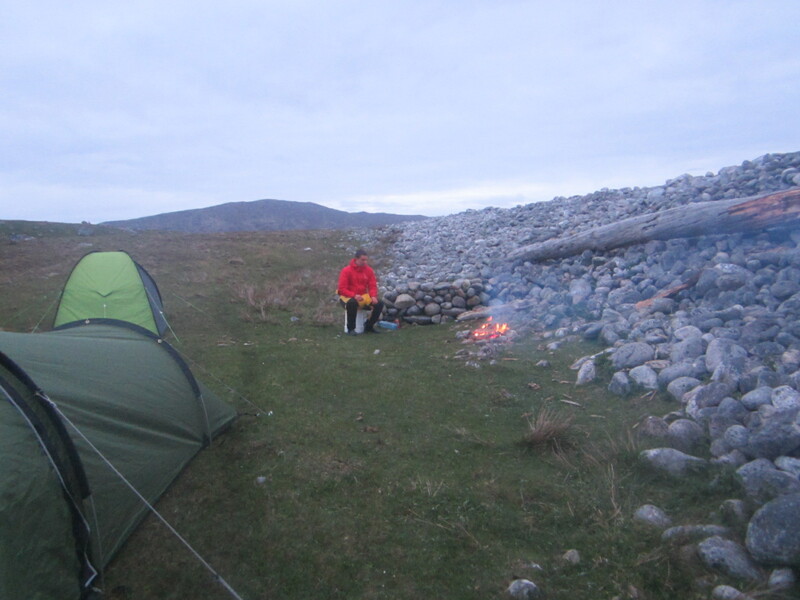 A shelter wall, firewood and a fire followed and by the time the wind eased (7pm) we had given up any idea of further progress. 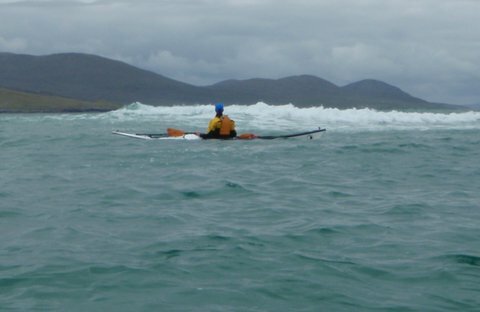 Sunday morning was overcast and breezy but the crossing to Taransay appeared on. After a difficult launch as we made our way out between a wave break and the shore a large otter appeared, stared and disappeared. 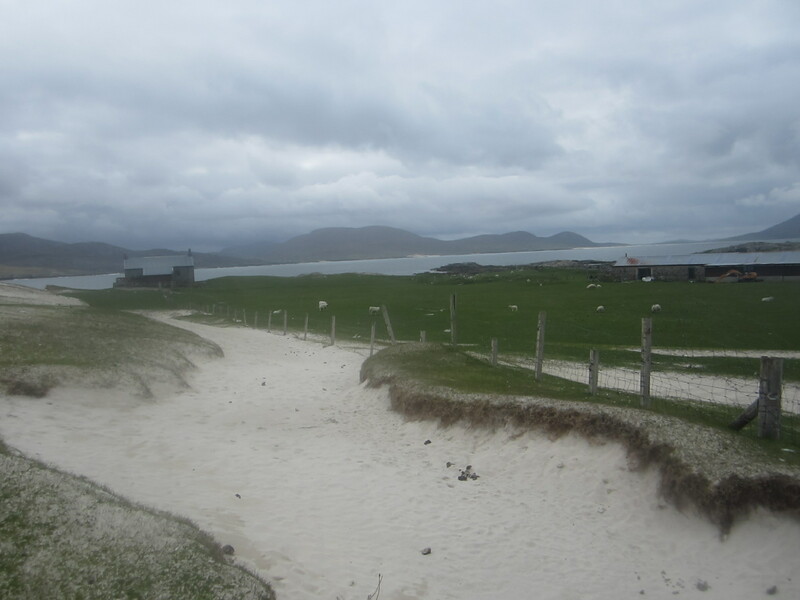 Taransay was featured in the BBC series Castaway in which 30 people were landed on a deserted island for a year. The identified objective was to observe the development of a community. 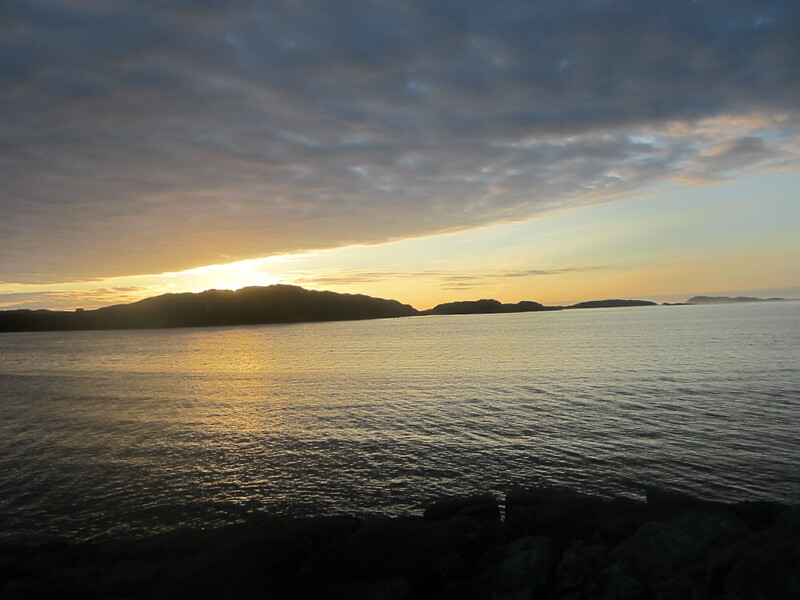 The island is large, relatively fertile and has some beautiful sand beaches. Sheep are grazed over the whole island and there are a couple of summer holiday houses. All round it appears to be a very pleasant place. 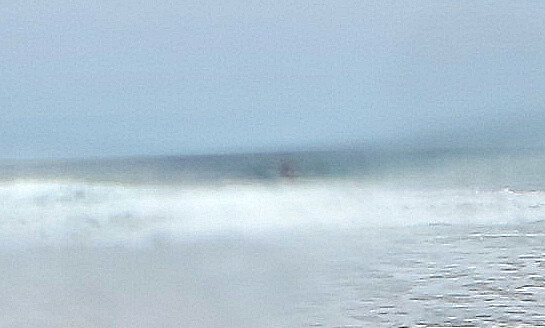 Objective achieved we crossed to another lovely surf beach for lunch (nice bouncy entry and exit) and then back via Isay to the car for part 2 of the trip. 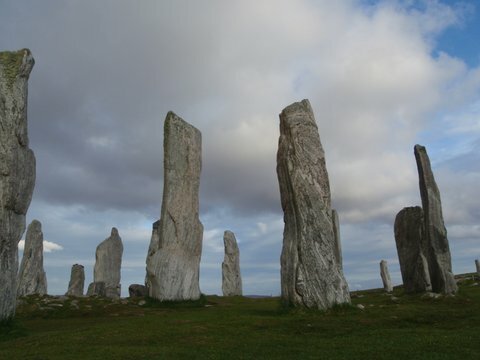 Wild camping from the car was surprisingly difficult, but, after an hour driving around and a trip to Callanish Stone Circle we found a lovely picnic site above a wonderful surf beach just north of Carloway. 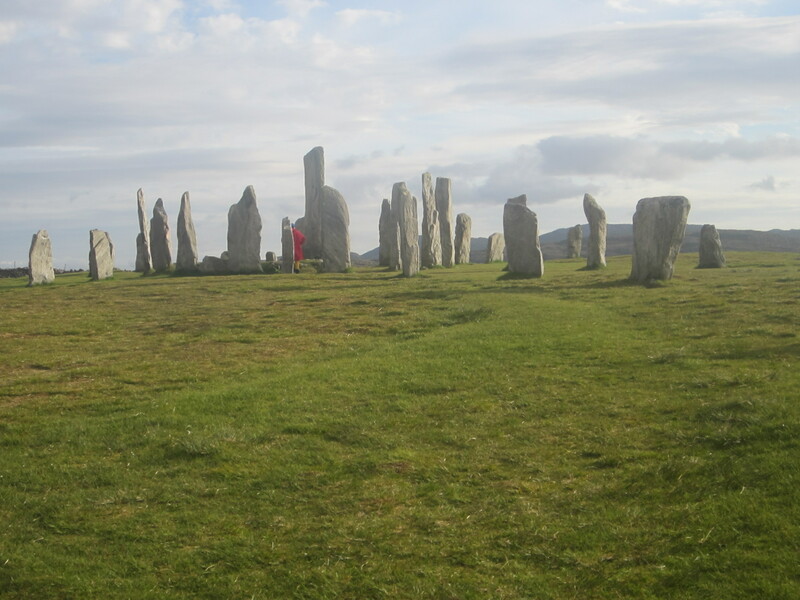 Our launch site was back towards Callanish. 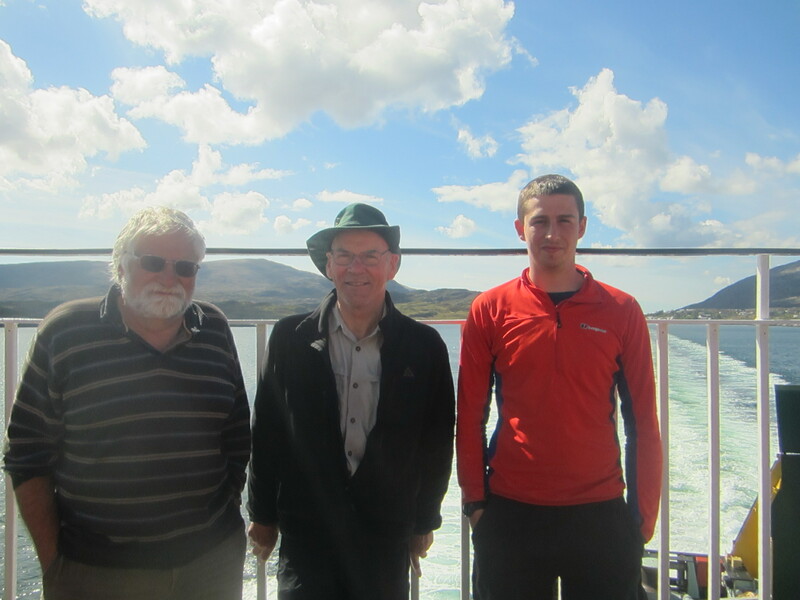 From here we headed out for a circuit of Great Bernera. 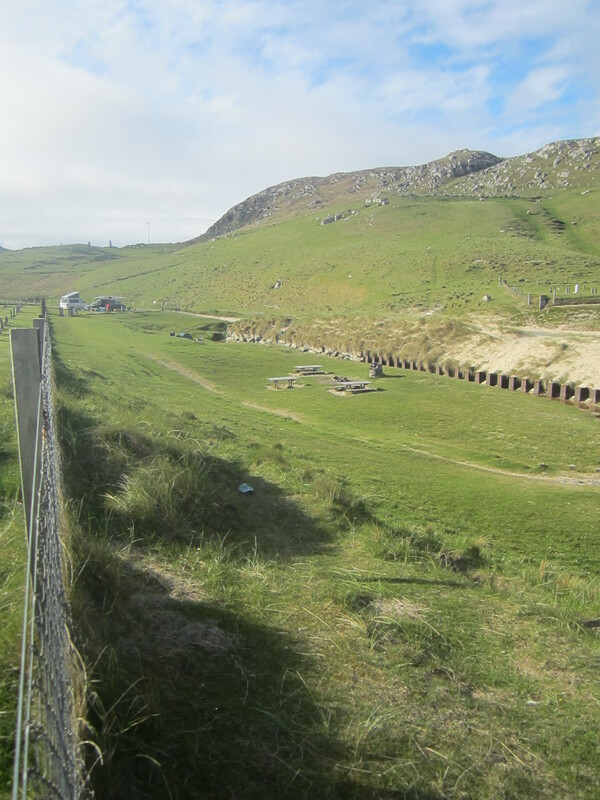 Noticeable features of this area were the population of Great Bernera (apparently “cleared” from the mainland in the 1870s), the extensive fish and mussel farms and the stunning sand beaches. 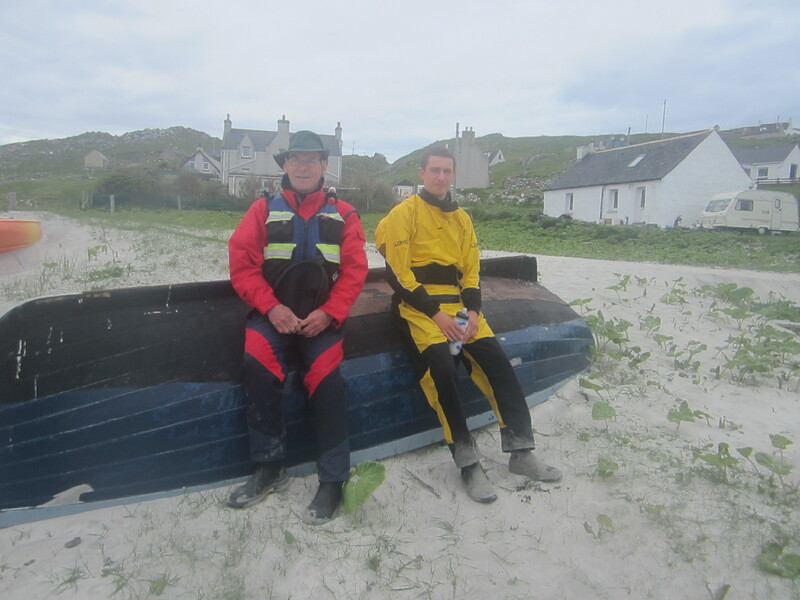 Possibly the best of them was our lunch stop on Little Bernera. After lunch we rounded the headland and into the sizeable Atlantic Swell. 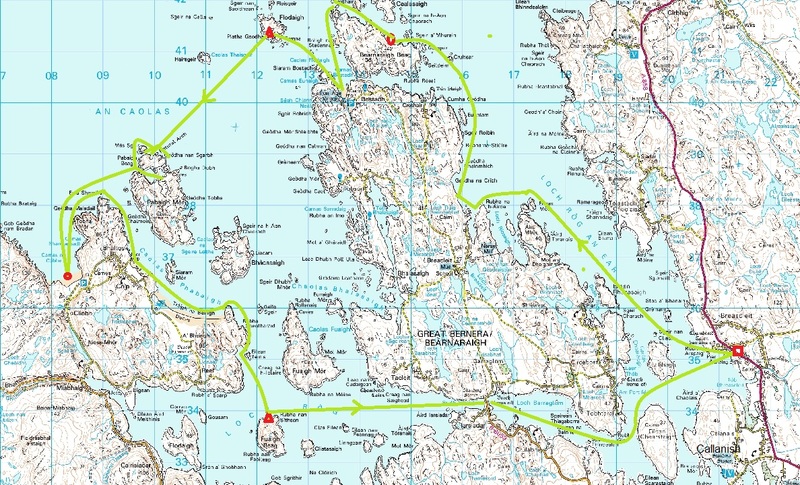 From there we headed to the channel between Great and Little Bernera before landing on yet another golden beach. 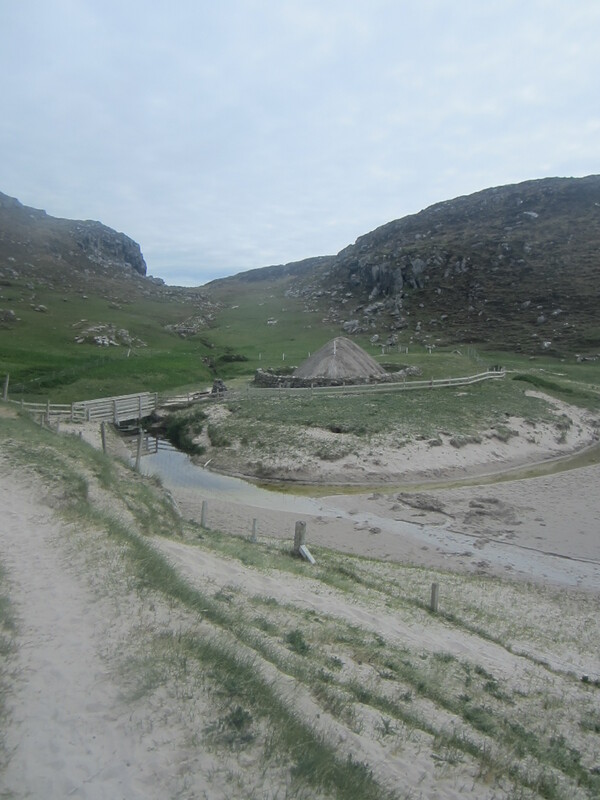 The main interest at this beach was an Iron Age village which had lain undiscovered under a layer of sand until recently. A feature is a reconstructed house which, unfortunately was closed. 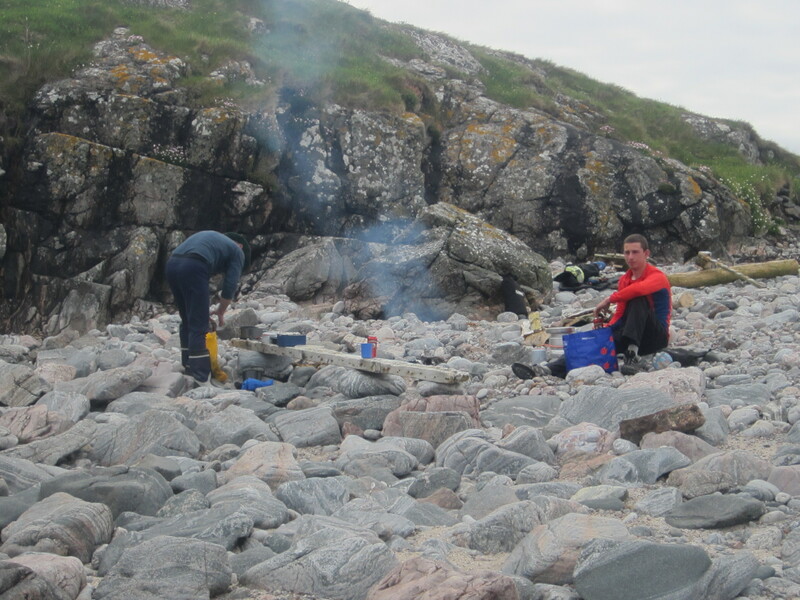 After some debate a rock beach on the island of Floddaigh suggested a possible place for the night. As we left we were drawn towards a basking shrk that had apparently been in the area all afternoon. 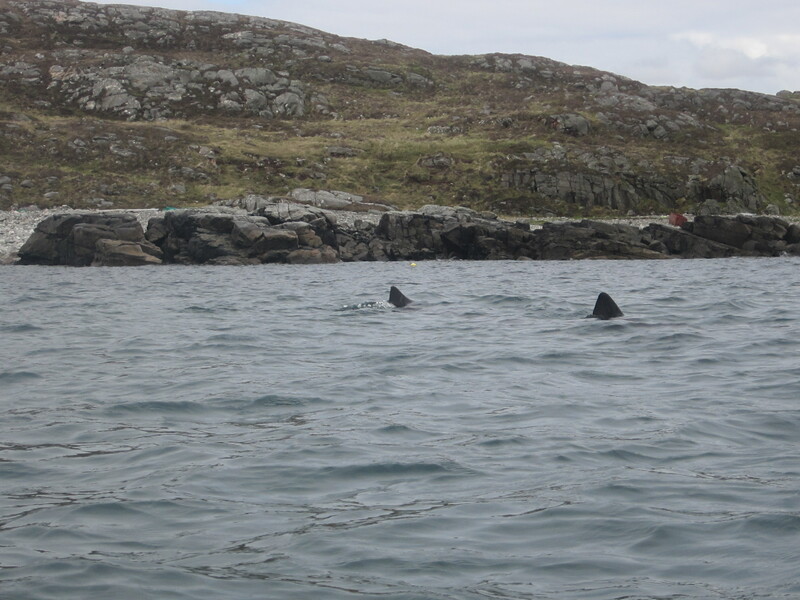 We were lucky enough to get a close inspection of the fish whose length was around 20ft. 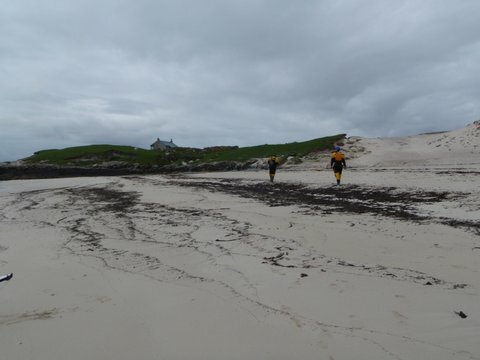 Floddaigh was the nesting place for thousands of sea birds and care had to be taken not to tread on nests and newly born chicks. 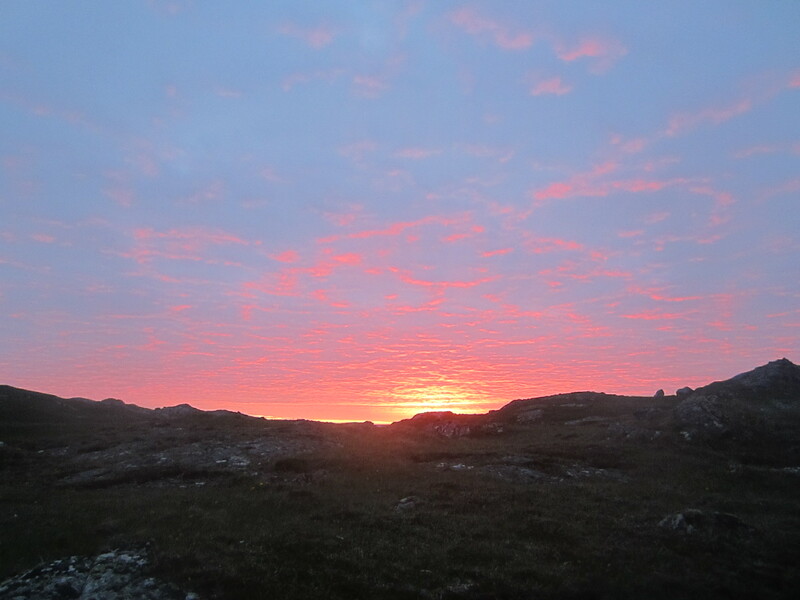 There was however a mass of wood, flat ground and a stunning sunset. The clear sky of the previous evening augured well for Tuesday. 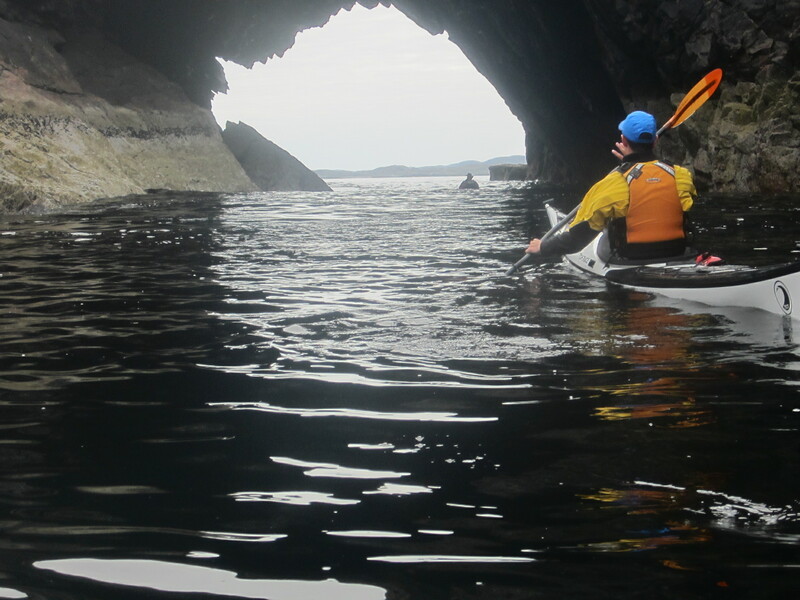 The first objective was the famous (among keen sea kayakers) Pabbaigh Mor. As we approached a dolphin/porpoise decided to play in front of us. The island proved to live up to its reputation. 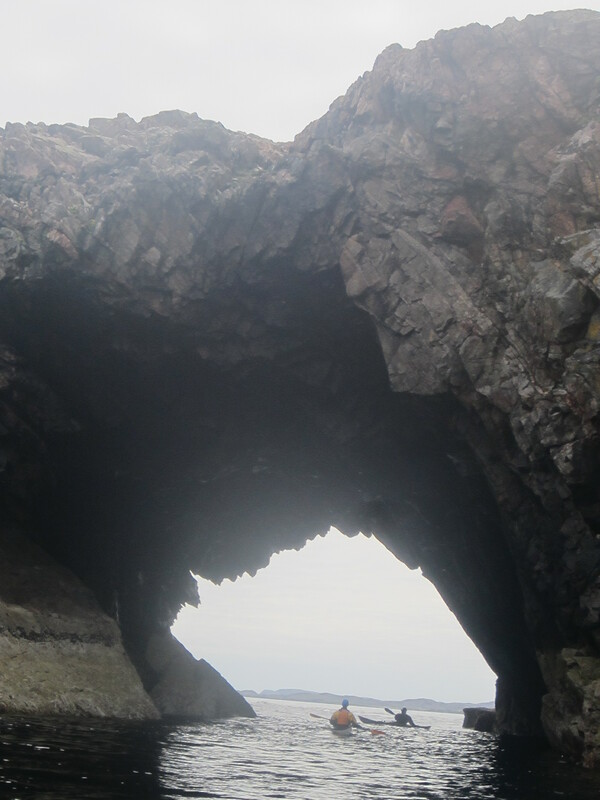 The first feature is a large sea cave but this was of minor interest compared to the stunning natural arch. The photos were taken at a quiet period. 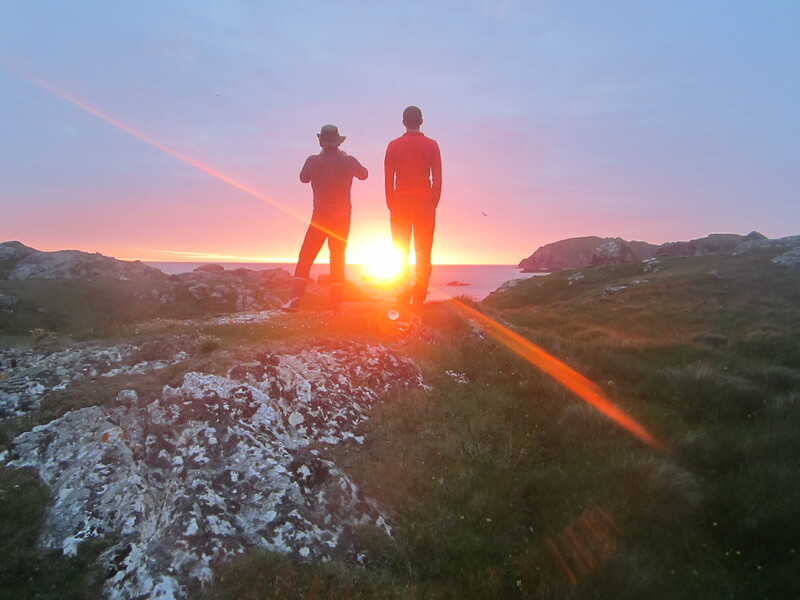 In fact the big swell at times generated a very exciting experience! 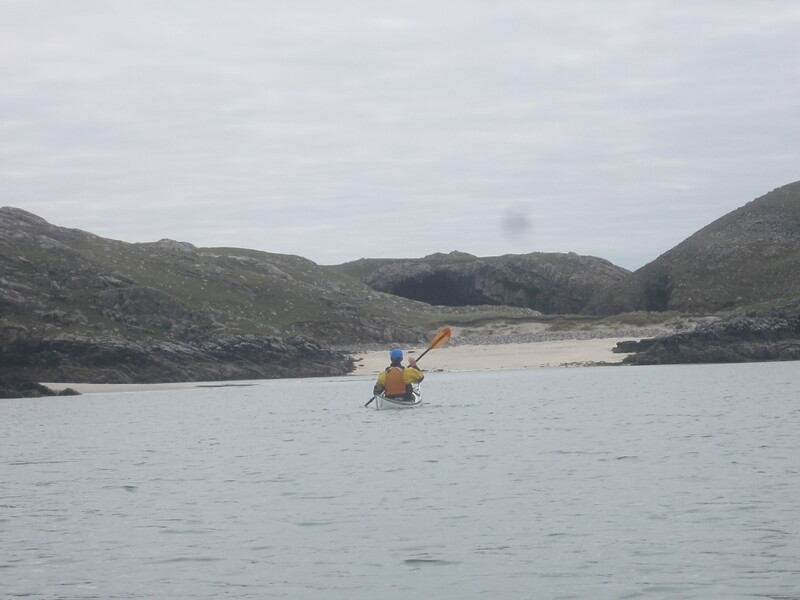 We next sought out the entrance of the lagoon but after entering what looked like the entrance we decided the tide was probably too low so we opted for the south entrance. En route was a “gap” , confused and treacherous in the big swell. After a long period of contemplation sense won over challenge and we went round outside and then into the lagoon. After the tumult outside the lagoon was amazing, with three lovely sand beaches and completely quiet water. It also had a wide north entrance that we had missed. We then decided to investigate the sand beach just 3km away at Camas Cliobh. 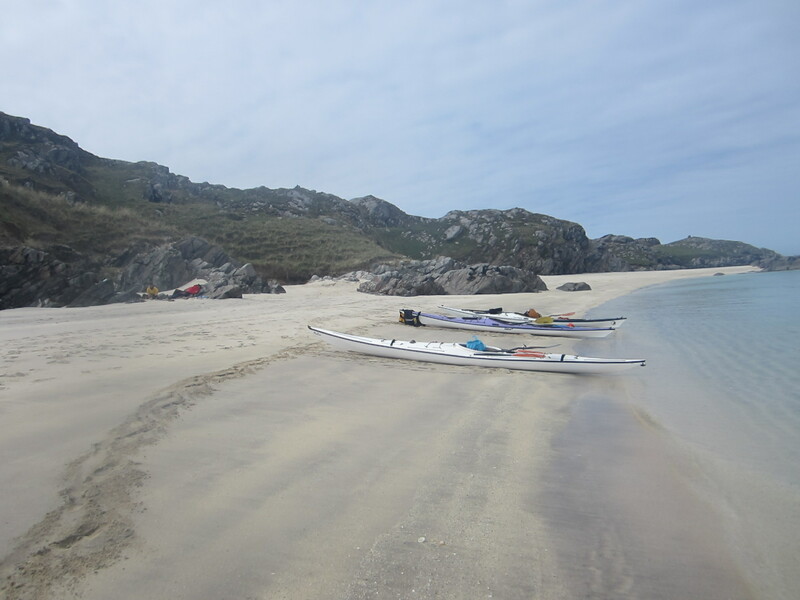 This beach was totally open to the Atlantic so we expected some surf, but it appeared from the sea to be relatively small and canoeable. This was not the case. All of us were turned and Geoff ended up on the sand upside down. We then spent the next 30 minutes trying to work out how best to get out. The shape, frequency and power of the surf and the resulting shape of the beach made exit problematic. 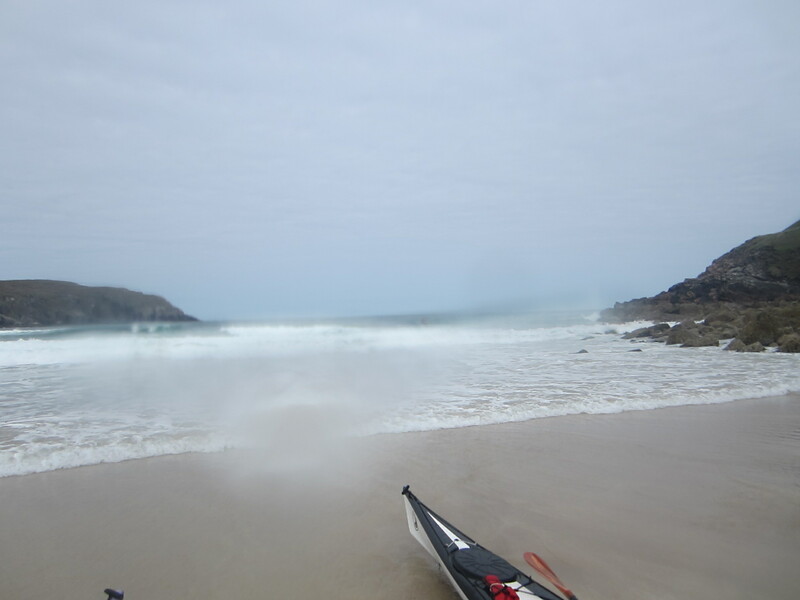 Just as the kayak floated it was hit by a wave, turned, filled with water and beached. 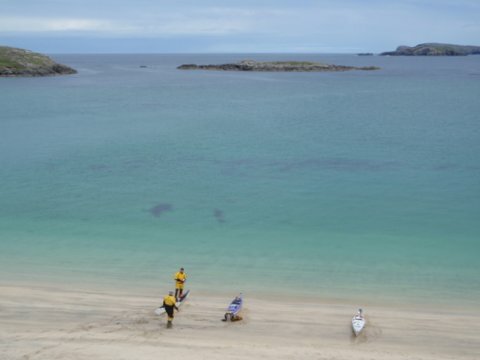 What was required was a young flexible paddler who could get into the kayak after the initial wave break. Our hero was Jamie who towed the old men past the first break to allow them to escape and then managed to get his boat clear” and use the keyhole cockpit to get in. Once past the surf line his kayak was pumped out and we were all clear. After the excitement we paddled on the the township of Bhaltos which offered a telephone box and campsite in the way of services and two more glorious sand beaches. 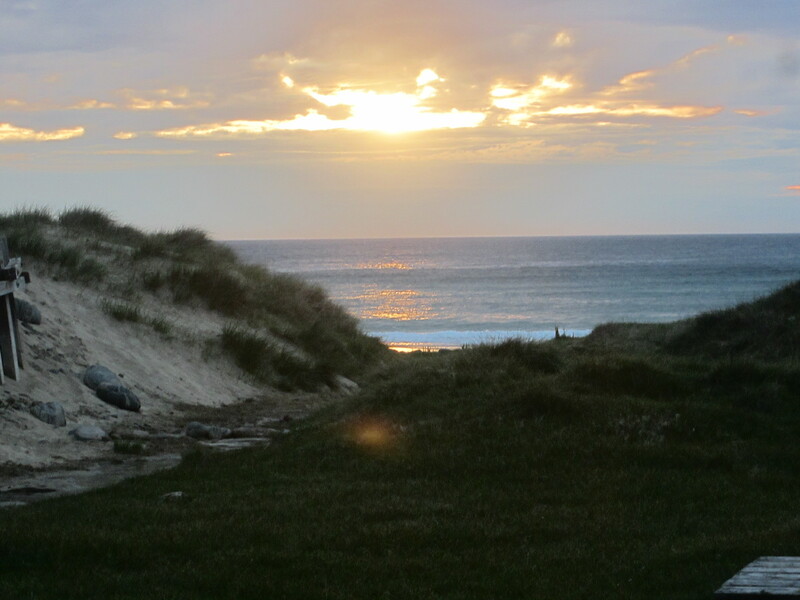 The ideal campsite has a sand beach, flat turf immediately adjacent, good views and a wood supply. Unfortunately the first and last are very rare and we put the fire as a higher priority than soft entry and exit. 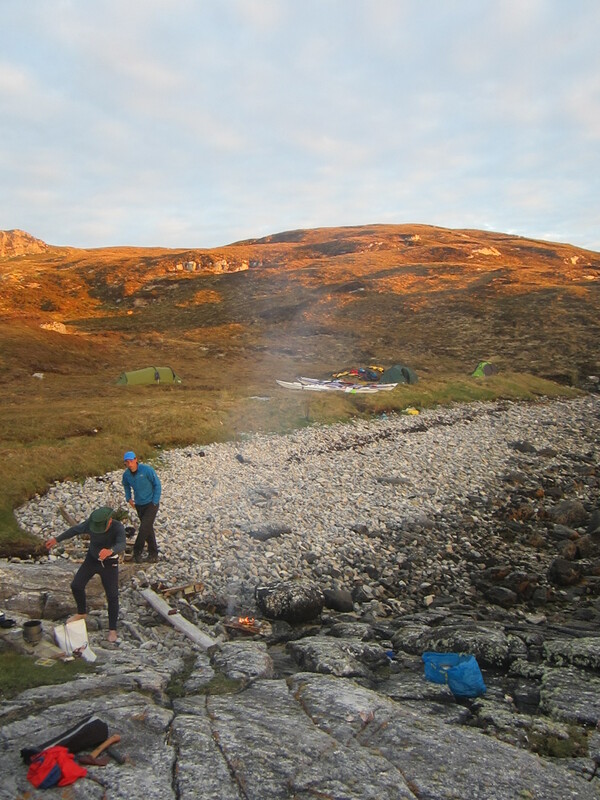 So we choose the island of Fuaigh Beag for our final camp., a very satisfactory choice. 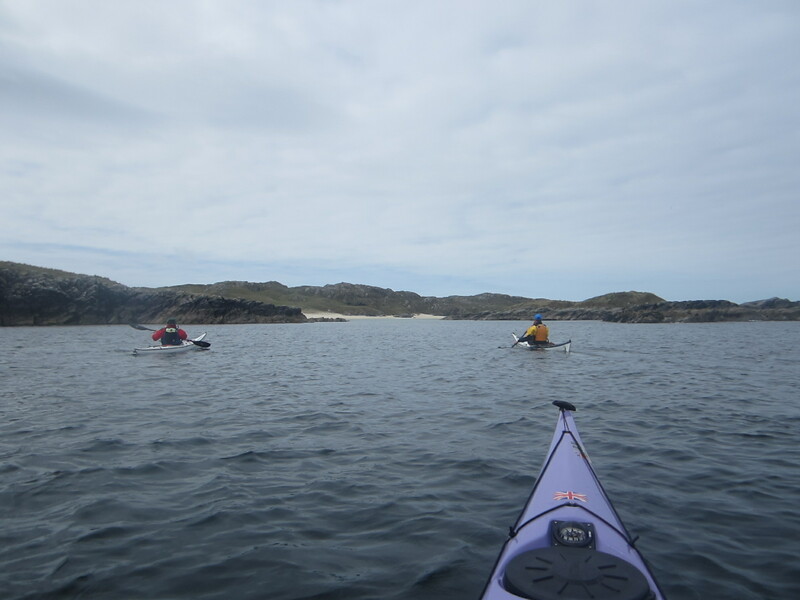 The final morning was a quick paddle across the east side of Great Bernera under the bridge. and we reached the launch site at around 11pm. Sadly we found a side window had been smashed, possibly by a stone from the road. We suspect the police do not really believe this either but, in any case, they were extremely helpful and found us an autoglass agent who immediately fitted a temporary window for th long journey home. 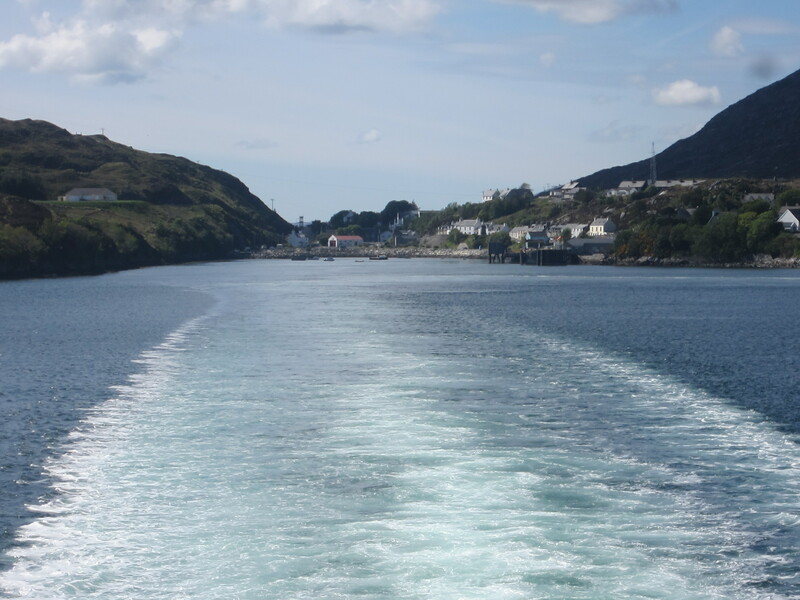 If it was deliberate the locals in Stornoway certainly tried to make up for the sins of their brethren and we safely caught the 4pm ferry from Tarbet. It was a beautiful crossing. With wonderful weather the route back must be the most glorious drive in the UK. crossing/passing five wonderful mountain ranges; The Harris Hills, The Cuillins, Glen Shiel, Ben Nevis and the Grey Corries and finally Glencoe. IT was a fitting end to an excellent trip.